Liz chose to spend her birthday hiking and so after some research, we chose to hike to Panther Creek Falls. 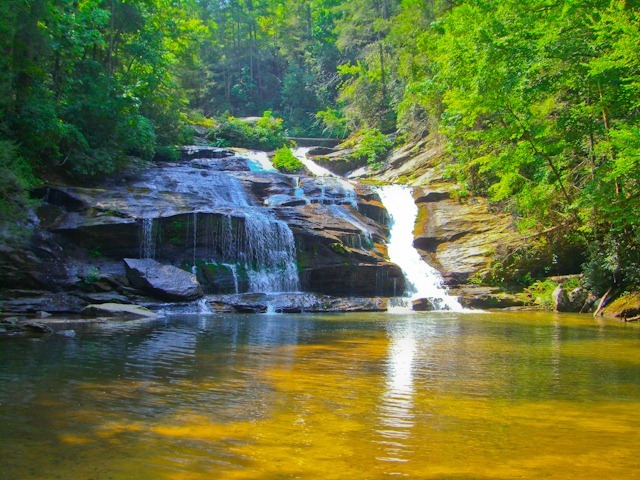 The falls are located in Habersham County, GA and the trail follows the creek in for over 5 miles. We parked at the Panther Creek Recreation area lot just off of Old Historic Hwy 441 and from there it was about 3.7 miles to the falls heading south east from the parking area. 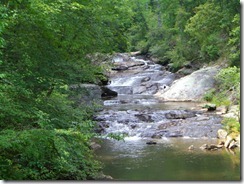 The trail takes you under the 441 overpass and follows the creek into a beautiful and quiet area of the forest. 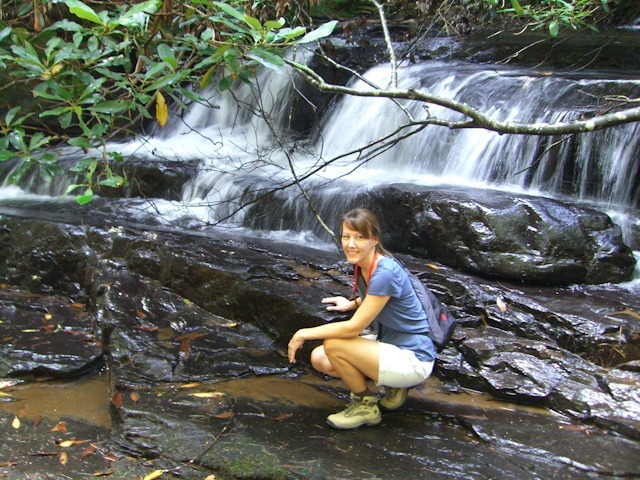 The scenery changes significantly along the entire hike so you are treated to new surprises. Sections of the trail are high above the water and then later meander down to the creek-side. There are several shoals, rock outcroppings, ledges, side-paths and more along the way that make excellent spots for exploring or just taking a short break. After going under the overpass, the creek falls well down below you on your right as you navigate the trail above. You will see green rectangular markers that mark the trial. About 1 mile in, the trail split and Liz wanted to explore the fork going down towards the water. There we found the first shoals and took a few minutes to explore around on the slippery rocks. We then back-tracked up to the main trail since our directions indicated that was the route to reach the falls. For some distance the trail follows above and away from the actual creek. About halfway in, the trail merges down to the creek and takes on a very different look at it follows along the flat creek bed. The path is sandy, wide and easy to walk with many natural ferns to adorn the way. You cross over the creek on a small wooden bridge and then have an easy go for the next few minutes. Several tributaries run into the creek but are easy to cross. 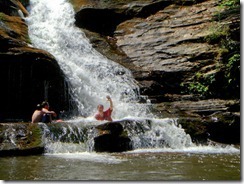 After another mile or so, the steep cliffs return and you reach Mill Shoals Falls on the left. Many hikers stop here thinking they have reached the falls and do not realize that Panther Creek Falls are still about another mile away. From here to the main falls is the most difficult part of the trail but also the most beautiful. 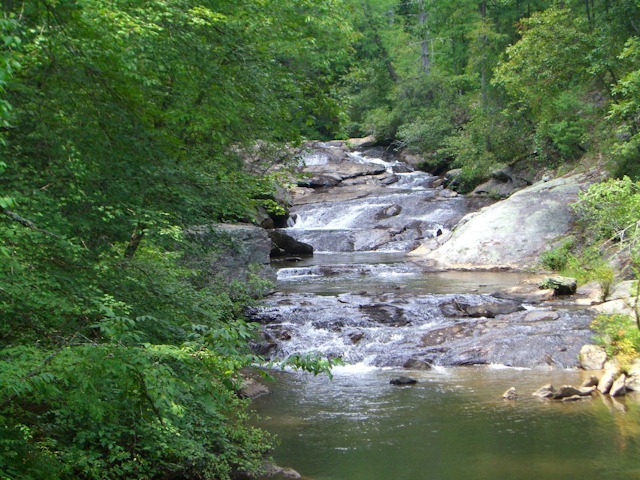 The creek makes a sharp bend to the left and the trail hugs it closely up on a ridge about 30 to 50 feet above the water. Once you make it around this bend, Panther Creek Falls are just ahead. 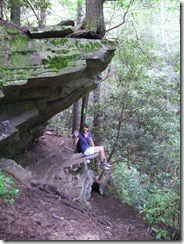 Once there, it is a steep drop down the creek bed but not too difficult. 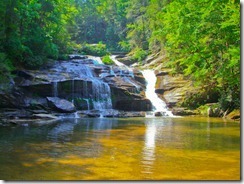 Once there, you will enjoy a bit God’s wonderful design as you take in the beauty of the falls. 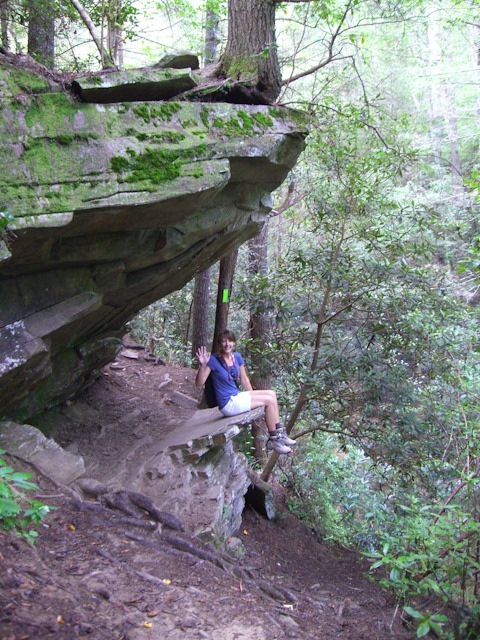 Don’t forget to visit the top of the falls too by following the side trail off the main trail near the top. 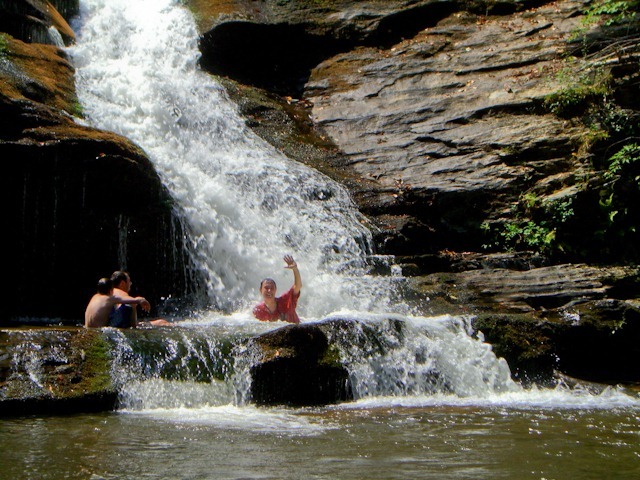 This area can provide a more quiet spot to enjoy the water away from the crowds that tend to gather at the bottom. The view is wonderful and there are more rocks and pools for enjoying the sun and getting wet. Don enjoys the icy cold water. Happy Birthday Liz, what a great way to celebrate your special day. We loved the photos and expecially the video. You all are so capable with techonlogy!!! Have a great year Liz. We love you…… From The Schrivers!!! Hey Don! Thanks for sharing your blog. You truly gave Liz a wonderful birthday experience! God’s glorious handiwork is apparent in your photos and video! ~wishes for a wonderful semester for Liz, even in her challenging circumstances. I know you will be a great encouragement to her! Thanks guys. I passed your comments to Liz. She really does appreciated them. Great little synopsis of the hike. 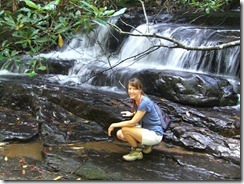 Panther Creek is my favorite hiking/camping spot in the land….I’ll be there in about a week, actually. Looks like you all had a good time. Cheers!